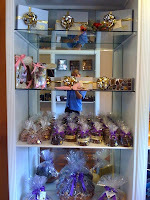 On October 28, 2009 we had our first newspaper and online article written about our shoppe. It was a couple of days before Halloween and we were the featured business in the Madison Chatham this Week paper that gets distributed free to every home and business in our two towns. It was great publicity for us as everyone who now walks into our shoppe mentions the article. Thank you. "Gourmet chocolates guaranteed safe for those with any nut or peanut allergy." We are so excited to offer their delicious chocolate milk and dark pretzels, custom shaped holiday and rose pops, sweet and semi-sweet baking chips and skippers. We also get in holiday specific chocolate such as gold coins, large santas and toffee peppermint bark. We now place an order at least once a week and can add any items you would like to our regular orders. This amazing company "was founded by the mother of a little boy with a peanut allergy. Their entire selection is completely safe for those with any tree nut or peanut allergy -- and they can also be enjoyed by anyone who loves fine chocolates."